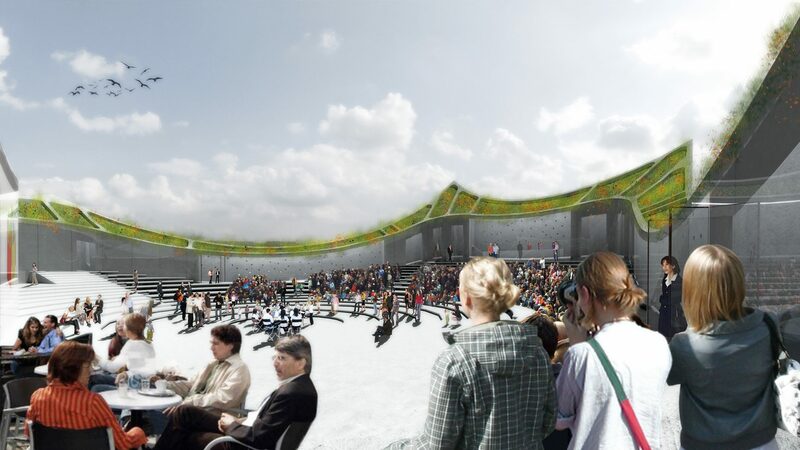 Given its proposed location, the new Auditorium and Arts Center is intended to become an inviting activity center that will establish a new connection between the consolidated old town of Torres de Cotillas and the recently designed office park complex. 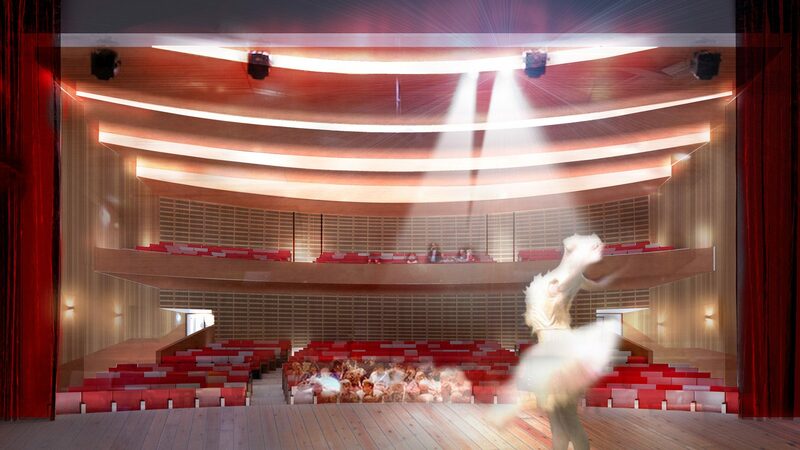 In order to solidify this connection we propose for the new Auditorium and Arts Center to become a 24-7 activity center. This will be achieved through the creation of an outdoor public agora that will double the activity levels of the originally required program. Located in the upper level of the building, the space will be able to hold concerts, social events and public meetings. 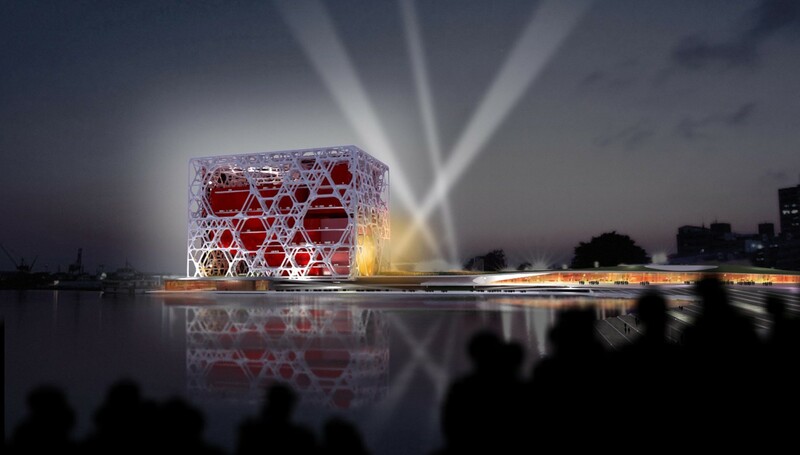 Due to the current depleted condition of its surroundings the building adopts a decisively introverted architectural expression. However, the austere nature of its exterior facade is balanced by the open, light filled spatial qualities of the interior. The building’s structure is constructed almost entirely of concrete. The exterior perimeter walls being a double layer of reinforced concrete. Gravity loads originated by the public space in the upper level are distributed through a series of radial concrete beams forming the horizontal support assembly. Additionally, a series of concentric, circular concrete elements form the seating platforms for the upper public space. The interstitial space, created between them, provide an opportunity for a continuous clerestory ring that fill the large ground floor public spaces with light. The seemingly severe concrete exterior is softened by the introduction of a small series of randomly placed penetrations in the wall. 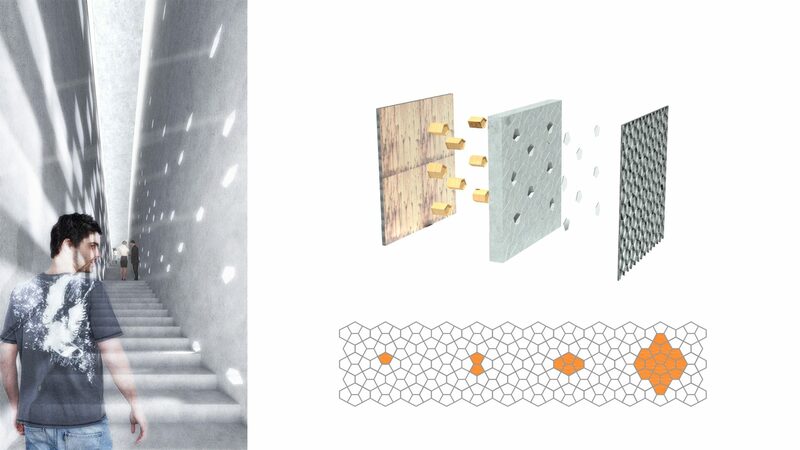 These penetrations are created using a system of solid glass elements embedded within the concrete wall itself. 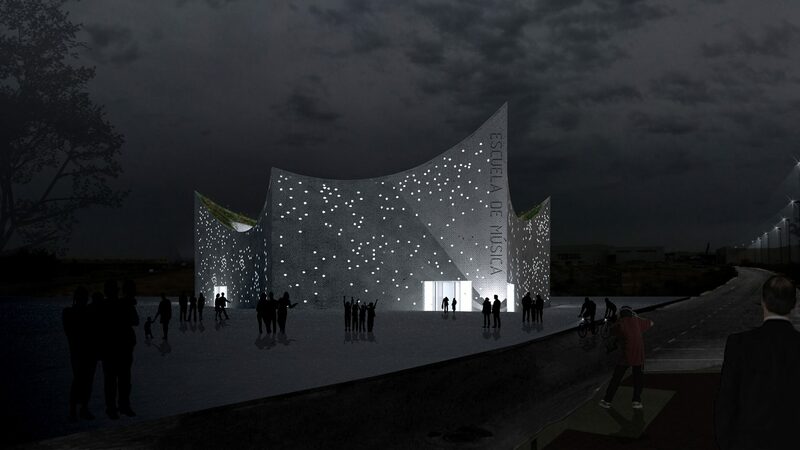 During the day the wall allows light to filter through to the interior of the building while at nighttime the building presents a very different expression; the small, randomly placed penetrations will glow emphasizing both the building’s role as a community beacon and it’s condition as an ever eventful activity center. 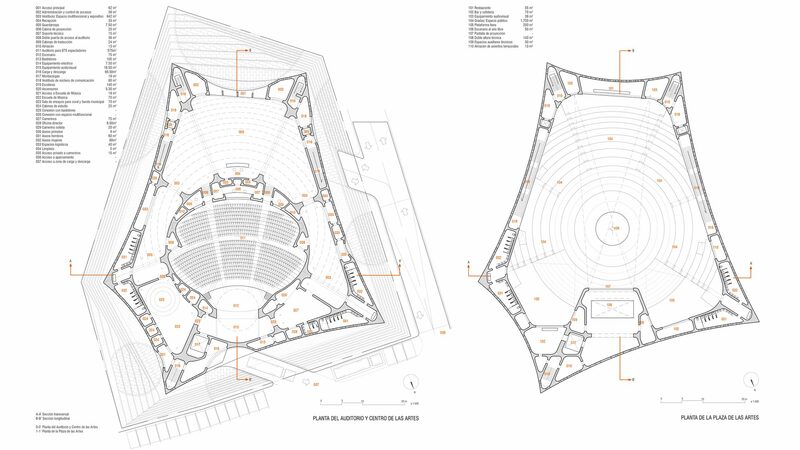 The space-maximizing floor plan encompasses three well-established areas; The first being the structural perimeter edge, defined by a double wall of concrete, an acoustic cylinder that embraces the Auditorium as a whole, and the space between them. The second area is the main pedestrian entrance, juxtaposed off of the square, is designed as part of the renovated design, while access to the School of Music emphasizes a relationship with the old town. Finally, the third area proposed allows traffic-vehicle-access in the same manner as the ‘plan parcial de los Carmenes’. 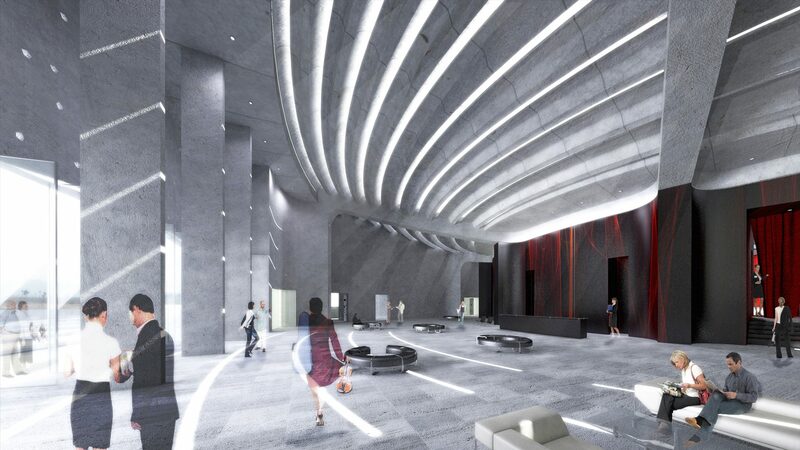 The heart of the Auditorium is bordered by a semi-circle, multifunctional lobby. The open, spatial quality of the lobby, achieved through multiple skylights, offers a versatile area which is easily adaptable for various events. The internal layout of the lobby allows for and invites varying activities to take place taking place. This magnificent hall grants access to a rehearsal room and also to dressing rooms. The two spaces are united by the technical area within the auditorium, giving easy-utilization to musicians who choose to make-use of the aforementioned ameneties.